Father Time keeps guard over Mount Moriah Cemetery atop the grave site of John H. Jones (1826-1874), the first owner of Mount Moriah Cemetery. 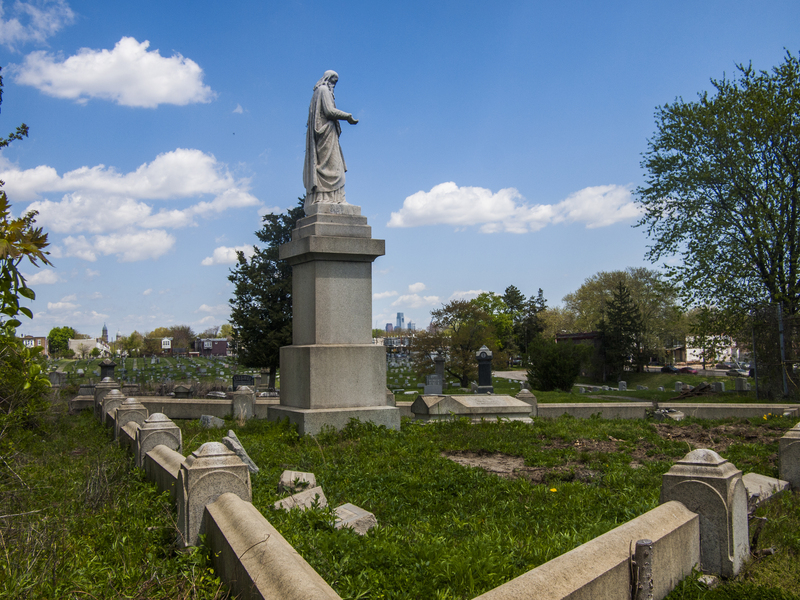 After the death of Horatio Jones in 2004, there was no clear owner of the cemetery for a solid decade until 2014 when the Orphan’s Court appointed the Mount Moriah Cemetery Preservation Corporation as receiver, 02 May 2015. 07 May	This entry was published on May 7, 2015 at 7:41 am. It’s filed under Historic Preservation, Philly Skyline, West Philly and tagged Mount Moriah, Philly skyline. Bookmark the permalink. Follow any comments here with the RSS feed for this post.